I had another debate this morning about whether to go out in the Vibram FiveFingers or not. I was really excited to run in them, but just before bed last night was finally starting to feel the aches from yesterday morning, including an incredibly tight right calf. But I rationalized that warming everything up with a VFF run would just let me get good and stretched out! So I squeezed into the toe pockets and took off towards Coit Tower. It was a little over a year ago in this very town that I first laid eyes on what I thought was the most bizarre footwear I had ever seen. I took note after hearing an odd foot slapping sound approaching me from behind on the Embarcadero. I came home and mentioned them to fellow runner and POSE practitioner Jeremy who immediately told me they must have been FiveFingers. I just laughed when I first checked out the web site and shook my head. But now a year later, here I am pleased to hear that familiar footslapping sound in the town where I first discovered them, coming from my own feet. 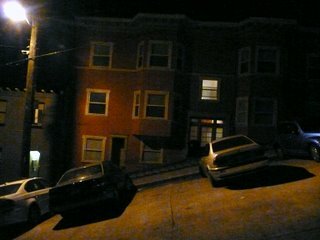 I passed through the Chinatown gate on Grant, and ran straight over to Lombard, then turned to attack the hill. I took the roads up to Coit Tower, and was surprised to see a couple other runners on stairs. As I got around to the other side, I naively realized that I would be taking stairs down the other side, and quickly got a bit lost. There is quite a rabbit warren of staircases on that hill! I caught the same runner I had seen now going down, and he helped me get back on my route. That dude does 45 minutes of stairs in the morning – what a great workout! Back through the financial district and I was still loving the FiveFingers the whole way. The financial district is quite boring to me compared with North Beach and Chinatown – I would opt for the latter if you are a visting runner in San Fran. I had a good long stretch when I got back, careful to work the calves and the piriformis stretches. I still don’t know how much is VFFs vs. San Fran hills, but I’m definitely feeling those 2 relatively short runs! Good times, though. This entry was posted on October 27, 2008 at 10:10 pm	and is filed under FiveFingers, Training. You can follow any responses to this entry through the RSS 2.0 feed. You can leave a response, or trackback from your own site.